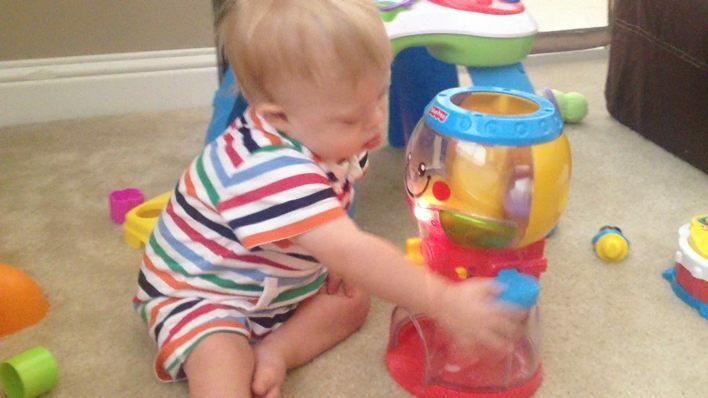 You are here: Home / Resources / 6 Reasons Why The Fisher Price Fisher-Price Laugh and Learn Count and Color Gumball Machine Should Be In Your Child’s Toy Box! Because Playing With Toys Is Just So…Typical. So if you’re a new parent of a child with Down syndrome, I hope all of the videos on our website replace some of your fear with hope. All children are unique in their own way, and just remember to celebrate, not compare your child’s achievements. Your child will do amazing things, and one day the fear you are feeling will be replaced with joy! 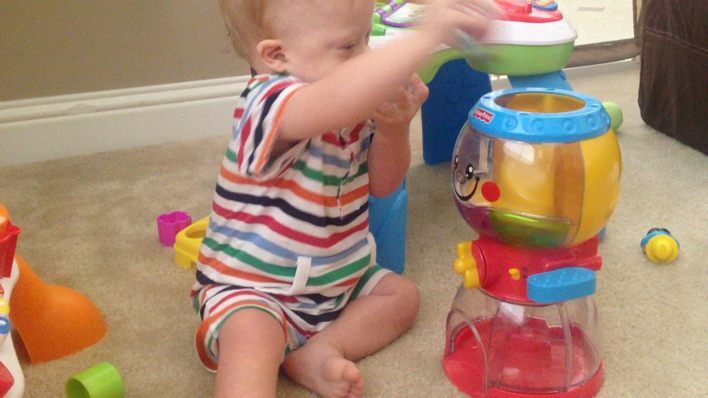 6 Reasons Why The Fisher-Price Laugh and Learn Count and Color Gumball Machine Should Be On Your Child’s Toy Shelf! 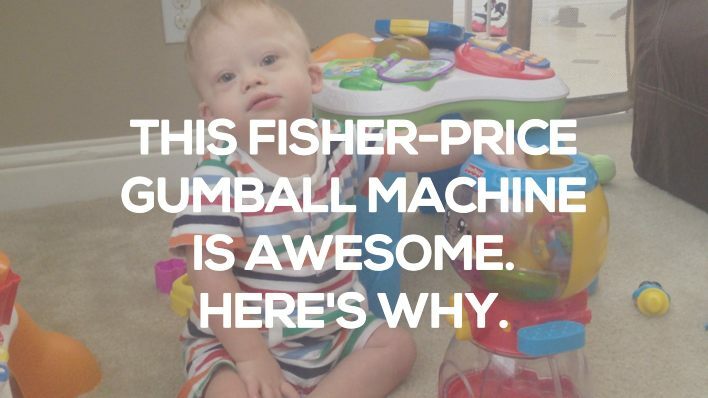 For those of you looking to pick up a fun developmental toy for your child, I thought I’d give you a few reasons why the Fisher-Price Gum-ball machine (or which ever one who choose to purchase) makes a fun (and useful) toy for your child. Just look at that cause and effect action! It took a while for Noah to get this, but when he finally did I celebrated him big time! It’s such a proud parenting moment when your see your child accomplish developmental milestones like this! Even what seems like seemingly small accomplishments for typical kids, are big wins for ours! Solving problems like a boss…! As you already may be aware, problem solving is an indicator of intelligence for children With Down syndrome…and this toy helps them develop those valuable problem solving skills! The problem is your child will want to make those balls come racing down the ramp accompanied by the fun music and flashing lights, but how, oh how will they ever make that happen? Ah-ha! They have to learn that the only way to solve their little toy problem, is by pressing the magical level on the side of the toy! And ala peanut butter sandwiches style, their problem is solved! 3. The Flashing Lights And Fun Music Are Great Developmental Motivators! We’ve also mentioned the benefits of developmental motivators in a pervious post as they can often give your child the motivational push they need to accomplish their developmental goals. And the Fisher Price GumBall Machine gives you (and your child) double developmental motivators for your money! 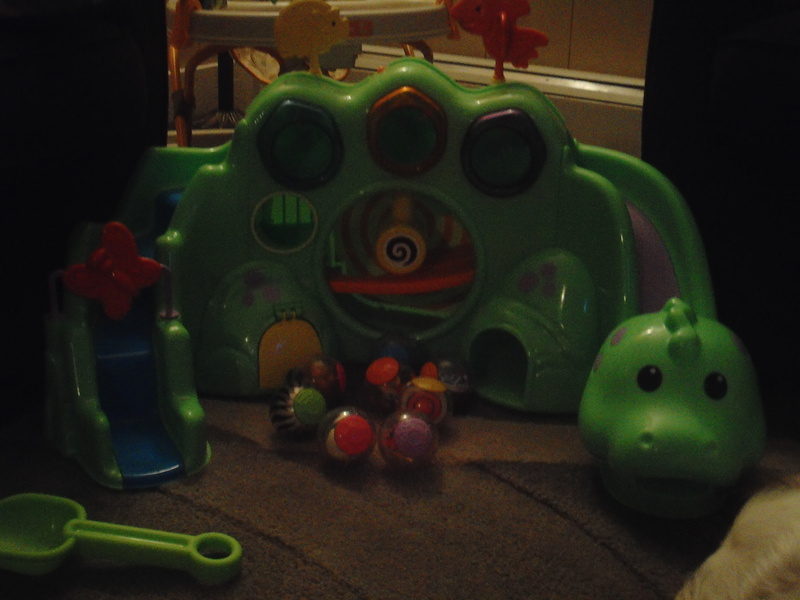 By the way, the lights and music can also help with sensory development, which is a bonus toy win! See, all of those annoying lights and music on your children’s toys do serve a purpose! Fine motor skills are developed when your child is using their hands to do an activity, and are important for many of the tasks our children will do in their life. When your child picks up the small plastic balls that go into the top of the cookie jar toy they are doing several things to help them develop their fine motor skills. Here’s just a few: weight bearing on their hands, postural control, shoulder stability, muscle development, development of the arches of their hands, thumb, and webspace, separation of the two sides of their hand which helps with in-hand manipulation, bilateral integration, and the development of their hand and finger strength! And to think…I used to think toys were just for playing! Who knew all of those toys lining the shelfs at our local toy store were really just cleverly disguised therapy tools! You gotta love this kid’s smile! In this video Noah’s only one year old (we’re a little behind on our videos, but we’re trying to get caught up!) and he’s almost three at the time of this writing and he’s still playing with this toy! As a parent I’m always looking for toys that are built to last, and have some longevity. Anyone else ever bought their child a Christmas present only to find it abandoned under a pile of wrapping paper collecting dust less than a day later? 6. It’s A Gum ball Machine!!! Because seriously…who doesn’t like gum-balls, and the machines they go into! Without a doubt the Fisher-Price Laugh and Learn Count and Color Gumball machine would make a great addition to your child’s toy collection. It’s a lot of fun, has great P.O.I . (longevity) and helps them develop in countless ways. I can’t recommend this toy enough! And seriously, didn’t Noah look super cute when he was playing with it? That little I’m-So-Proud-Of-Myself Smile was written all over his face…and I love it! By the way, if you’re looking for some other great toy recommendations be sure to check out our Christmas gift guide, and great toys for under 25 dollars as well! What do you think about this Fisher-Price Cookie Jar toy? Are you a fan? What other toys have you found useful (and your kids found fun?) Leave a comment below and tell us about it! And if you end up buying this toy please be sure to leave a comment and let me know, as well as what you thought about it once your kid has played with it! I (and other parents) want to hear about your experience. 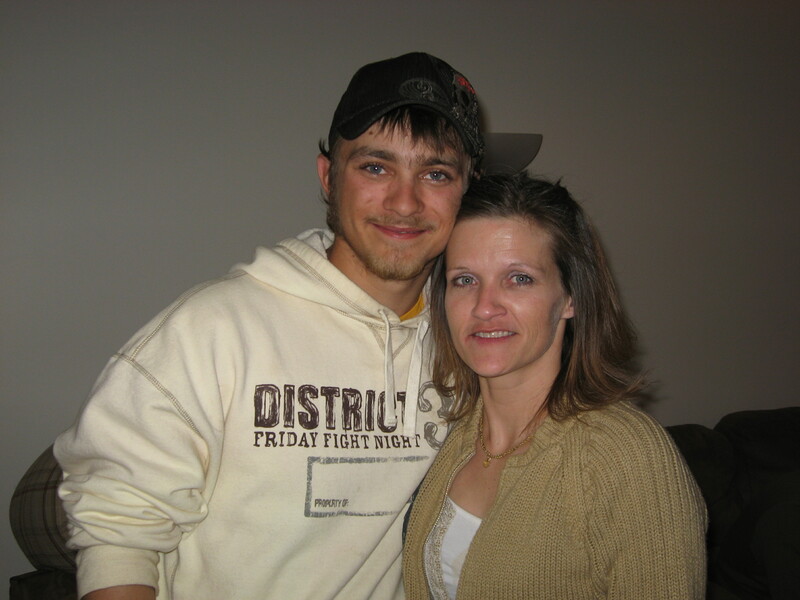 I absolutely love hearing about Noah every day. I’m teaching my 2yr old granddaughter that all people are different..all people need friends who love and care about them….ect! Very true, and good for you for teaching your grand daughter about the things that matter! Do you have a child in your family with Down syndrome? Also who is in the picture that you posted? Here is another Fisher Price toy that uses the same balls as the gumball machine…I found it at a 2nd hand store so I’m not sure if they still make it but it is really awesome!! These are TRULY bits of heaven…Inspirational, awesome looking forward to every NEW post..thanks! Thanks for the kind words, thankfully all of is are “little bits of Heaven” in a sense as we are all created in the image of God. I have four “typical” children – one who’s an adult – and I was (still am) conscious of the toys, games, books, etc. that they use. I want everything, even when they’re having fun, to help with their development and skills. My three younger children are 10, 8 and 7, and I have a granddaughter who is 1 so I get to experience some of the early development all over again. Noah is the most adorable little boy. I love how he responds to your woo-hoo. Years ago I worked as a substitute teacher and always prefered to work in the “special needs” classrooms. It opened my eyes to the differences and intelligence (!!!) of children who are different. The work could be hard, but the interactions were so rewarding. I loved witnessing and being apart of the accomplishments. You rock, Dad and Noah is right behind you rockin’ it too. Have a great weekend. Thanks for the kind words! It sounds like you guys have a houseful, I bet that’s fun! You mentioned you used to be a substitute teacher, what do you do now? 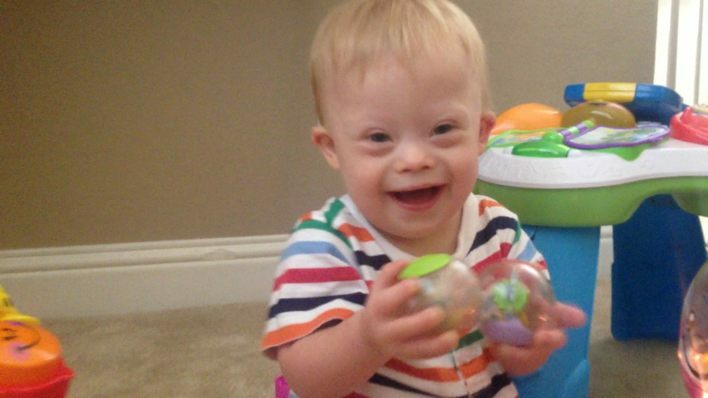 How do your you get children relate and get along with your older child with Down syndrome? We are expecting a new baby at the end of Feb / early March and can’t wait for Noah to be a big brother! I had to do a psychology paper on the importance of toys and how they aid in the development of children and this article not only helped my paper but also made me burst with joy. Noah is an incredibly beautiful child and I am so happy there are people like you to show everyone that Noah is just as important and lovely as any other child. Thank you, for restoring my faith in humanity! Keep at it!